An addition to the existing set of dust, scratch and defect removal tools, the SilverFast Clone-Tool is a powerful tool for the removal of severe defects. SilverFast HDR Studio 8 now features three differently focused tools for the correction of a wide variety of issues, making post-processing in other software unnecessary. Dust and scratch removal tools, such as iSRD and SRDx, quickly reach their limit in cases of serious defects, such as wide scratches, ﬁnger-prints or large-area damage. These tools are able to detect large defects, but are unfit to correct them. With the Clone-Tool, however, you are now able to easily repair defects by stamping data from similar, undamaged areas onto the damaged areas. 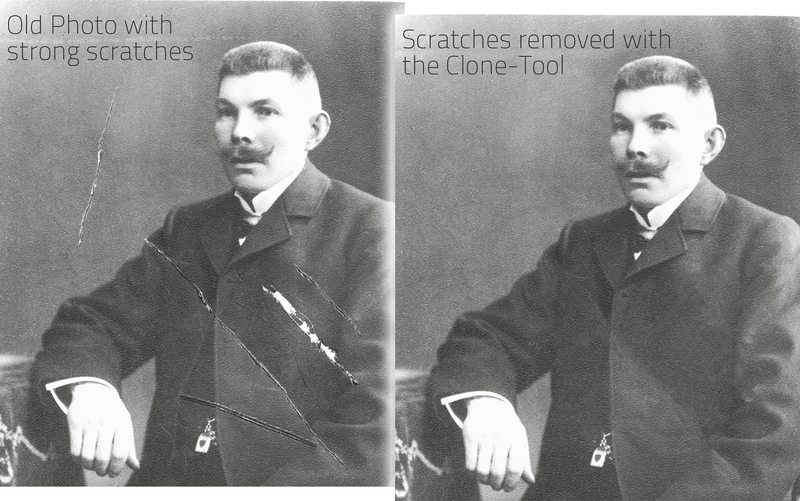 The Clone-Tool complements the iSRD (infrared-based) and SRDx (software-based) workﬂow in the efﬁcient removal of dust, scratches and defects. 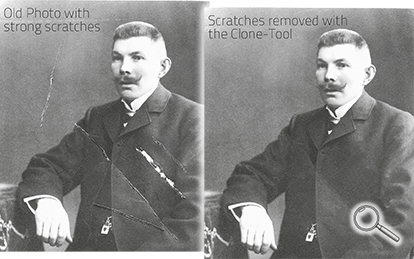 In addition to the core functionality of correcting defects, it is also possible to use the Clone-Tool to completely change entire image areas by adding or removing details. ✔ … removing deep scratches. ✔ … correcting large-area image defects. ✔ … removing or duplicating image details. 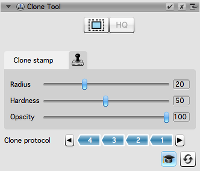 How does the Clone-Tool work? 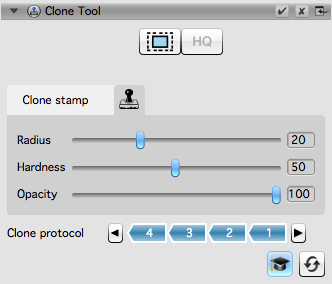 To open the Clone-Tool dialog, click the Clone-Tool icon in the vertical toolbar in SilverFast HDR Studio 8. Activate the HQ preview to get a 100% view of your image. Define the source area from which you want to copy image information to the target area by holding down the «ALT» button and mouse click into the preview. The source area is represented by the crosshairs icon and it will follow your movements when cloning. During the cloning process you can see a circle around the crosshairs which indicates the function's radius. Use the three sliders to adjust the stamp size, the hardness of the produced edges and the transparency for the cloned area. Expert mode provides the ability to undo individual clone operations. An entry is added to the clone protocol for every clone operation. Click on individual entries to reverse the appropriate steps.